Young persons in seventh grade through twelfth grade may take an active role in worship by serving as an acolyte. 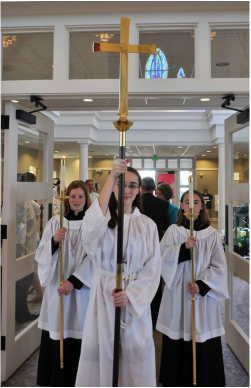 Acolytes receive training and are then assigned to serve primarily on Sundays at the 10:00 a.m. services, as well as at festival services such as Easter and Christmas. The Altar Guild cares for the vestments, vessels and other items used in the liturgical services of the church. Teams of four work one week each month preparing the Altar and Chancel for all services of worship occurring during that week. Parishioners volunteer and participate in training to serve as lectors. They are responsible for the readings from the Lectionary and the prayers during Sunday worship and on special occasions. Lectors also assist in administration of the Eucharist. Our ushers and greeters extend a friendly welcome to parishioners and visitors at each service. The ushers distribute bulletins, pass the alms basins, and carry the elements to the altar where they are received by the clergy for blessing in preparation for the Eucharist. Greeters assist newcomers and guests in finding their way around the church. The Flower Guild creates floral arrangements to grace the Altar throughout the year with the exception of Lent when we prefer to leave the Altar bare. The group also coordinates the festive seasonal arrangements during Christmas and Easter.